There’s only one way to interpret the confusion in the past week over the “resignation” of Vice President Teofisto Guingona as secretary of foreign affairs. It is that President Gloria Macapagal Arroyo wants him out of the DFA — and wants him out quickly. That much should be apparent from the eagerness with which she “accepted” a resignation which we were later told was made verbally, but which Guingona has denied making, and the equal haste with which acting Press Secretary Silvestre Afable announced Guingona’s “resignation” and Mrs. Arroyo’s “acceptance” of it — and then released to the media copies of her letter to Guingona. Apparently Mrs. Arroyo, who appointed Guingona in 2001 to what in certain countries is the premiere cabinet post, has changed her mind about who should head foreign affairs since then, or a scant year later. In 2001 she had chosen Guingona vice president over other contenders on the strength of his Lakas credentials. The vice president of the Philippines has no other designation except that of president-in-waiting, and assumes official functions only in the event that the president is somehow incapacitated. In the manner of her predecessors Corazon Aquino, Fidel Ramos and Joseph Estrada, who named their vice presidents to the cabinet so they can do something else other than wait for history’s summons, Mrs. Arroyo named Guingona secretary of foreign affairs. The post is prestigious enough, and in the hands of someone with a vision of the role foreign relations can play in advancing national interest, could be a critical one. Mrs. Arroyo may or may not have appreciated how the conduct of foreign relations can be supportive of national interests. As a politician, however, it is likely that she saw foreign relations as of no immediate consequence to domestic politics. She might have since discovered her mistake. Since her appointment of Guingona, Mrs. Arroyo’s most critical policy decision has been to reverse the country’s gradual departure from its long years of dependency on the United States. The most significant of the events that marked that departure was the rejection by the Philippine Senate in 1990 of a new treaty that would have extended the life of the US military bases in Clark and Subic for another 25 years. What made that rejection meaningful was that it meant an end to the presence of foreign troops in the Philippines, which for decades had been the sure signs of the its status as a neo-colony. That a foreign power, specially the United States, had the military means to directly influence events in the Philippines if it chose to, meant that the country’s independence could at any time be challenged if it suited the United States to do so. This was among the reasons why the Senate rejected the 1990 treaty, but that point has either been lost to Mrs. Arroyo, or has never been quite clear to her. Her decision in January of 2002 to bring back US troops, though in reduced numbers, at the very least suggested that the presence of foreign troops with the potential to directly intervene in Philippine affairs was not for her an issue of sovereignty, as it was apparently not the case for most Filipinos. It was almost inevitable that Guingona should oppose the Arroyo administration’s acceptance of US troop presence. On the consistency of his conviction that the country’s interests are best served by domestic and foreign policies that reject any form of subservience to any foreign power specially the country’s former colonizer, Guingona cannot be faulted. He opposed the 1990 treaty as well as the Visiting Forces Agreement in 1999, and opposed the involvement of US troops in Balikatan. 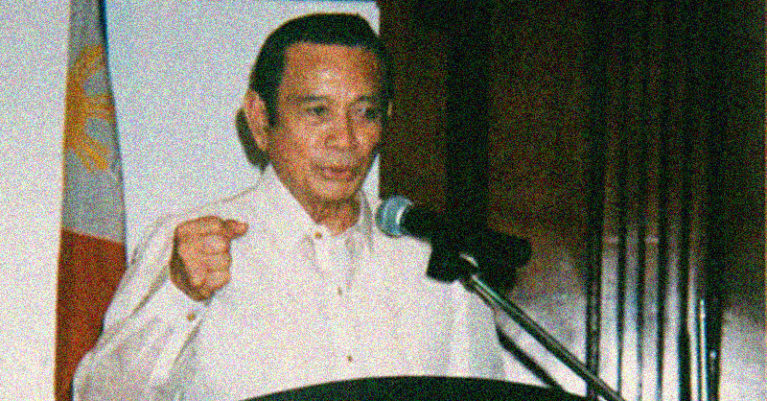 In 1990 as well as 1999 Guingona supported those civil society groups opposed to both treaties, and, as in the past when he fought the Marcos regime, joined them in the streets. On the other hand, Mrs. Arroyo — whom the US think-tank Strategic Forecasting (Stratfor) predicted even before she assumed the presidency as likely to revive the country’s close military relationship with the United States — has always appeared eager to live down some past flirtation with left-wing groups since she was first elected to office by assiduously cultivating a pro-American persona. A shrewd analyst of Philippine politics if also a cynical one, Mrs. Arroyo has either come to know — or had known it even before she assumed the presidency — that US support has always been crucial in the outcomes of Philippine politics. This does not mean that she is not ideologically convinced of the validity of US support — only that it is at the same time convenient for her purposes, among those purposes being her election in 2004. That has become more and more problematic. As her approval ratings drop and as the opposition prepares to field candidates in 2004 who will challenge her in the circus and popularity game we otherwise call Philippine elections, Mrs. Arroyo will need all the help she can get as that crucial year approaches. What she doesn’t need for 2004 is a contentious foreign affairs secretary likely to oppose at every turn her efforts to turn back the clock and to return the country to the fifties, when the planet was divided into The Enemy and Us. That is exactly what the world is currently like to the United States — “if you’re not with us you’re against us” — thanks to the brutal and stupid attack on the World Trade Center on September 11, 2001. Now as in the fifties, it’s between the forces of freedom and democracy once again, on the one hand, versus an evil enemy driven by pure malice to destroy something it envies — except that it’s not the international communist conspiracy any more, but international terrorism that’s the enemy. This is a contest that as defined by the sole remaining superpower on the planet permits no other interpretation of the current state of the globe, and in which Mrs. Arroyo has committed the country to unequivocal, unquestioning support not only for United States policy, but also for any and all actions it will choose to take, whether it be in Afghanistan, Iraq, North Korea, Iran, or Basilan. Presumably the United States has expressed its displeasure over Guingona’s insistence on looking over every footnote in the Philippine-US agreement on the Balikatan exercises, his steadfast opposition to its extension, and his public expressions of skepticism over the wisdom of fielding more US troops in Zamboanga and Basilan — and quite possibly in the future, in those other places in the Philippines where the Philippine military has been unable to defeat those other armed groups whose struggle was born out of, and is sustained by, the inequities of Philippine society. There is also the matter of the eventual return of US military bases, though of course under another name. Stratfor claims that the Abu Sayyaf campaign is but an excuse for the United States to eventually establish a more permanent military presence in the Philippine south, from where the US could project military force to deal with the Muslim militant groups based in Indonesia. This goal explains, says Stratfor, the US forces’ enthusiastic construction of roads and other infrastructure in Basilan. Aside from making access to the mountainous areas of the island easier, these roads and bridges would also be already in place once an agreement is reached between the Philippines and the US for the latter to have a more permanent presence on the island. If Stratfor is correct — and the creeping enlargement of the US troop contingent as well as Mrs. Arroyo’s granting requests for the extension of its presence even before they’ve been made suggests that it is — Guingona would be a constant thorn on Mrs. Arroyo’s side between now and 2004. It has been argued that in opposing presidential initiatives in committing the country to US purposes, Guingona has been less than a team player. There is a difference, however, between blind acceptance of policies one cannot accept in conscience, and working hand in glove in furtherance of policies based on national interests. What the Arroyo government — what the country — needs are in fact more Guingonas, it being so patently clear that he is an exception to a distressingly uniform belief in the wisdom of Philippine engagement with US purposes to the possible detriment of Philippine interests. Guingona isn’t the problem, but part of the solution.